Hairstyles are devised to make women look prettier and appealing. They are tried on hair of any and every length in various shapes with the single aim of making the lady beautiful. A wedding occasion is the most important event in the life of a girl and she wants to wear her crowning glory in the most beautiful fashion. One that looks romantic, gorgeous and elegant. And the first hairstyle which comes to mind encompassing all the three qualities is the half up half down wedding hairstyle. Nothing else can match the glory of cascading wavy locks falling in style and the best part is that it can be easily worn on hair of shoulder length and above. Half up half down wedding hairstyles have a carefree look too and it is easy to carry, which is good for the heavily jeweled up bride. The half up half down wedding hairstyle is decorated with crown bands and flowers to gloss up the look. Here we have a collection of thirty half up half down wedding hairstyles which is bound to impress you. So, come and take a look at the brides in different hairstyles. Here we go. If you liked our selection, perhaps these other posts will interest you too, Wedding Hairstyles For Long Hair, Easy Updos For Long Hair, Half Up Half Down Hairstyles and Cute Hairstyles For Girls. Long wavy locks parted sideways on front with a puffed up top and decorated with floral beads. White lilies adorn the shoulder length wavy layers with parted bangs on front. Back view of curly locks in twin colors tied half up and half down. Light brown tresses pulled back into a loosely tied side pony covered with the wedding veil. Twisted locks falling on shoulders with hair at the center pulled back neatly. Slanting front bang parted with a crown band and a puffed up braided top. Swirly locks loosely tied at back with some falling on face have a distinct charm. Bouncy half up half down hairdo decorated with a flower pin at back. Parted with a crowned headband the swirly locks emanating from a puffed up top are let loose on side. Curly back hair tied with a floral band and layered bangs on forehead look sweet. Thick, long and curly locks tied back with a hairband are simple and beautiful. Flowers tucked within the braided bun with swirly tails look splendid. Flowers resting on puffed up top with wavy layers at back and slanting bangs is an exquisite hairstyle. Swirly locks in light brown hair pulled down from top with a sideswept bang tucked with a pin. The wavy dark tresses with short bangs on forehead pulled back with a clutcher have a classic look. 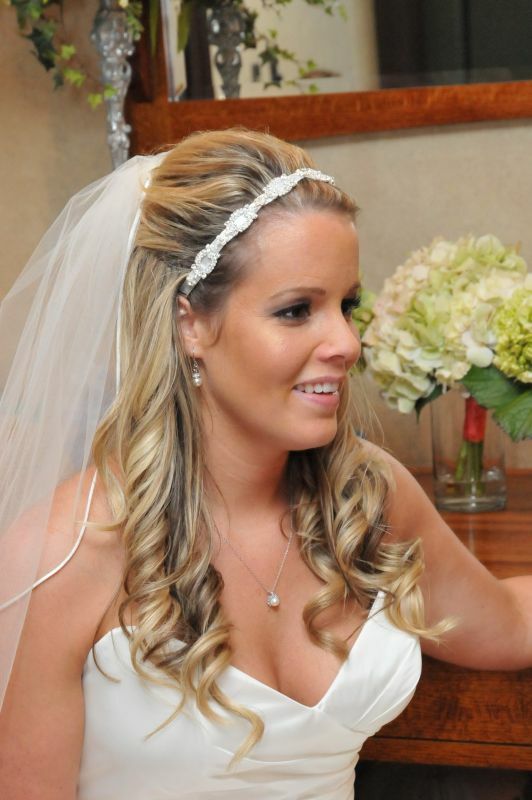 A sideswept bang on wavy blonde hair parted sideways with a puffed up top covered in wedding veil. This neat, elegant half up half down hairdo looks perfect on straight black hair with tilted bangs. The wavy locks with slanting bangs decorated with ornaments look gorgeous on the beautiful bride. This messy hairdo with wavy locks on front has a casual, carefree touch. Sideswept layers on shoulder with a neat puffed up top look elegant. Braided bangs pinned up with flowers on other side falling into straight hair on shoulders. Lovely bangs parted with a bouncy top and wavy locks collected on one side looks radiant. This simple and timeless half up and half down hairdo is a hot favorite among the brides. Wavy curled locks falling on sides with parted bangs on forehead decorated with a flower behind the ear. A silver hairband holds the puffed up hairdo with wavy blonde locks falling on sides. Shoulder length wavy locks carrying heavy slanting bangs held with a crowned band. Wavy blonde locks parted sideways with a puffed up front. Simple half up half down hairdo pulled back with a hairband. Jet black wavy tresses with a swirly puffed up top and lovely bangs add the charm to the ravishing bride. Black tresses parted sideways with wavy locks ribboned up at back let loose on one shoulder.